LMU researchers have shown that a defined set of 15 bacterial species protects mice from Salmonella infections as effectively as does the natural gut microbiota. The system will facilitate studies of host-pathogen interactions in the gut. The mammalian gut harbors thousands of microbial species – collectively known as the microbiota or microbiome – that interact with each other and with their host to form a complex ecosystem. In healthy organisms, this community provides an effective shield against infection by many pathogenic organisms, such as Clostridium difficile (which is responsible for antibiotic-associated diarrhea) and various Salmonella species. 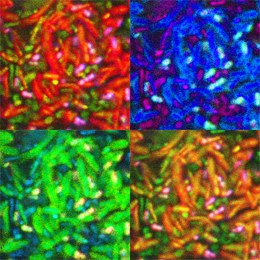 Researchers led by LMU microbiologist Professor Bärbel Stecher, in cooperation with colleagues from the University of Vienna and the Technical University of Munich, now show that, in the mouse, a defined group of 15 bacterial species confers the same degree of protection against Salmonella infections as does the host’s natural microbiota. The work establishes a new model system for the investigation of the interaction between the gut microbiome and infectious pathogens, which could in turn provide new approaches to the treatment of gastrointestinal infections. The new findings appear in the journal Nature Microbiology. The protective effect provided by the gut microbiota against infection by invasive pathogens is referred to as colonization resistance. Exposure to antibiotics can disrupt this mechanism because these drugs typically alter the composition of the bacterial population in the gastrointestinal tract. “However, the contribution made by individual bacterial species to colonization resistance remains unclear,” says Stecher, who is also member of the German Center for Infection Research (DZIF). “In order to gain a better understanding of the functions of the gut microbiota in this context, we had already established in my laboratory a minimal consortium comprising 12 bacterial species which are representative for the gut microbiome of the mouse.” This set of species, which is referred to as Oligo-MM-12, can be introduced into germ-free mice and is stably maintained over several generations. However, while mice colonized by the Oligo-MM-12 species are more resistant to infection by Salmonella enterica than their germ-free relatives, they are not as well protected as mice with a normal microbiome. The team then went on to develop a new strategy, called genome-guided microbiota design, to identify species required to confer the same measure of protection as the natural gut microbiome of the mouse. “We compared DNA sequences from the 12 species represented in Oligo-MM-12 with homologous sequences derived from the total mouse microbiome, and were able to identify groups of genes that were missing from our set,” Stecher explains. Some of these genes turned out to be characteristic for so-called facultative anaerobes, i.e. bacterial species that grow best in the presence in oxygen, but are nevertheless capable of proliferating in its absence. Indeed, the genus Salmonella consists of facultative anaerobes, while almost all the species that make up the Oligo-MM-12 consortium are obligate anaerobes – for which oxygen is toxic. “We therefore supplemented our original consortium with three facultatively anaerobic species that are found in the microbiota of healthy mice,” Stecher says, “and we were able to demonstrate experimentally that this combination confers the same level of colonization resistance against Salmonella as that observed in mice that have a natural microbiota.” Stecher and her colleagues believe that their new “mini-microbiota”, together with the use of genome-guided microbiota design, provides a powerful new tool for the identification of hitherto unknown functions mediated by natural microbiota. This opens a route to the identification of specific bacterial species that could ameliorate the effects of disease-dependent dysfunction of the gut microbiota.